GpsPrune is written in Java, so as long as your platform has a Java runtime (at least version 1.5) including GUI libraries then it should work. It was developed using eclipse and subversion on Debian Linux, and has been tested on Linux (Debian, Ubuntu, Mint, and others), also on Windows (XP, Vista, 7 and 10), and on Mac OSX and even Sun Solaris. Tested java versions run from Sun 1.5 to OpenJdk 9. Any bug reports, feature requests, suggestions and improvements are welcome. Currently GpsPrune is at version 19.2 (since December 2018), and is available from the download page. Meanwhile, development of further features is ongoing and progress is given in the development page. Again, any help to improve it would be gratefully received. In particular any examples of data which is incorrectly parsed, and any updates to the translations offered would be very welcome (see the translation wiki). GpsPrune is released under the Gnu GPL which specifies what you can do with the program and its source code. On DVD : GpsPrune is now included on the OSGeoLive DVD (since version 4.5 from April 2011) and is being distributed at geodesy-related conferences worldwide. On DVD : GpsPrune is included in the "top 100 open-source software for 2012" from com-magazin, and included in the January 2012 DVD. PDF user guide : A user guide to GpsPrune is also available in downloadable PDF format and browsable HTML format for sale. If you're interested in buying one, please see the user guide page. User survey : Thanks to all those who took part in the GpsPrune user survey! A summary of the findings are available at user survey results. IN PRINT : GpsPrune was featured in an eight-page review of various programs (GPSBabel, GpsPrune, My Tourbook and Route Converter) in the August 2014 issue of the German-language Linux Magazin! And guess which one of those four was the "Testsieger" ! Version 19.2! Version 19.2 of GpsPrune is now available in the downloads page. The map on the right shows where GpsPrune is being used in the world. Blue areas show where users of GpsPrune have reported its use. Green areas show countries where the official language is supported by GpsPrune, so it could be used there. 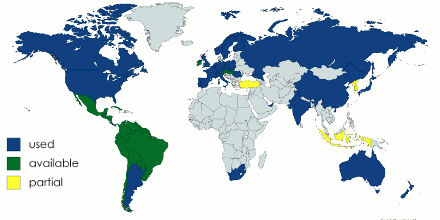 And finally, yellow areas show partial support (for the Turkish, Korean and Indonesian languages). Feel free to help update this map by reporting your country either by email or on the forum thread. Latest additions: Costa Rica (August 2017 by email), Argentina (May 2013 by email), Spain (January 2012 by email), India (January 2011 from the forum), Czech Republic (November 2010 by email), Finland (July 2010 by email), Russia (July 2010 by email), UAE (June 2010 by email), Alaska (June 2010 by email). Amazingly we're still waiting to hear from anyone using GpsPrune in many of the central or southern American countries, so please get in touch if you're using GpsPrune anywhere there. Similarly is there anyone from Ireland, or anywhere in Africa? Top-down, zoomable, draggable view of data points including map images from Openstreetmap or any similar map tile server (eg opencyclemap, hikebikemap, ...). Drawing of new tracks, and dragging points to reposition them. Interactive 3d display of data, including map and/or terrain. Export to POV format for rendering of 3d model by Povray. Loading, playing and correlation of audio files (such as wav, mp3, ogg) in the same way as photos. Download of tracks directly from gpsies.com, and upload back to gpsies.com (upload requires free registration). Weather forecasts for the current location, thanks to openweathermap.org. Multiple language support - currently Afrikaans (AF), EN (English), DE (German), DE_ch (Swiss German), ES (Spanish), FR (French), IT (Italian), PL (Polish), ZH (simplified Chinese), JA (Japanese), Portuguese (PT), Dutch (NL), Czech (CZ), Hungarian (HU), Korean (KO), Romanian (RO) and Russian (RU) are supported. Ukrainian (UK) is partially supported. With additional language files there is also partial support of Turkish (TR) and basic (extremely limited) support of Indonesian (ID), Danish (DK), Swedish (SV), Norwegian (NO) and Farsi (FA). GpsPrune is free software and everyone can help. The easiest way to contribute is to add or fix some of the international translations. Just head over to the translation wiki and edit the corresponding page (like editing Wikipedia, but easier). These changes will then get incorporated into the next build of GpsPrune. You can also suggest a new language there if yours isn't currently provided. Another way to help out is to give feedback on what you like, what you don't like, what doesn't work for you or what additional features you'd like to see. Even just feedback that you like it is always welcome! You can send this feedback via email (use the address at the bottom of the page), or via GpsPrune's sourceforge forums, or using the Github issues. Page last updated December 2018. Feedback welcome at mail@activityworkshop.net.